Whether you’re packing a lunch for yourself or your kids, it can be overwhelming to come up with healthy ideas everyday! As a Registered Dietitian I love to provide inspiration for nourishing, easy and delicious recipes, such as the recipes I share weekly on my Cooking Show! I also love to provide healthy eating tips to make sure that you’re truly enjoying your healthiest life. Today I’ve partnered with Yum Box to share my tips for packing a balanced and plant-powered lunch. Protein helps us feel full & satisfied. Plant-based protein sources include chickpeas, black beans, lentils, almonds, walnuts, pistachios, pumpkin seeds, almond butter, peanut butter, Organic tempeh, hummus & high protein grains such as quinoa. Plant-based protein sources are great because they provide protein AND fiber as well as vitamins and minerals. Also don’t worry if your kid is obsessed with one type of protein source & only wants that at lunch, for example peanut butter. Just stick with natural and Organic peanut butter to avoid trans-fats. To introduce new protein sources, try at dinner time when everyone is home and your kid is in a familiar place experiencing new foods with you. Carbohydrates provide our body with energy, which is key for getting through the afternoon! Focus on whole-grains such as brown rice, whole-wheat sprouted bread or whole-wheat sprouted tortillas or even oats! I love making tortilla, almond butter & honey (or maple syrup) roll ups for lunch, as pictured in this post. Load up on fruits and vegetables, and if you can include at least one serving of each. These foods provide vitamins and minerals as well as fiber which helps to slow digestion & provide the body with a steady and sustained release of energy. Lunch does not have to be complicated to be nourishing! Stick to as many real, whole-foods as possible such as fruits, vegetables, nuts, seeds, whole-grains and beans. Real, whole-foods are more affordable than packaged convenience items, are nutrient packed & will optimally nourish & satisfy you and your kids. It’s easy to reach for convenience items such as pretzels or chips (trust me I know! ), however the more you can include real foods in you and your kids lunch box the better everyone will feel. Involve your kids in the lunch packing processes with you. For example, let your kids decide if they would prefer grapes or apples in their lunch, or both! This way kids can look forward to a lunch that they helped prepare and are more likely to consume it. There are so many options for lunch boxes these days and a brand I recently discovered and liked right away is Yum Box. 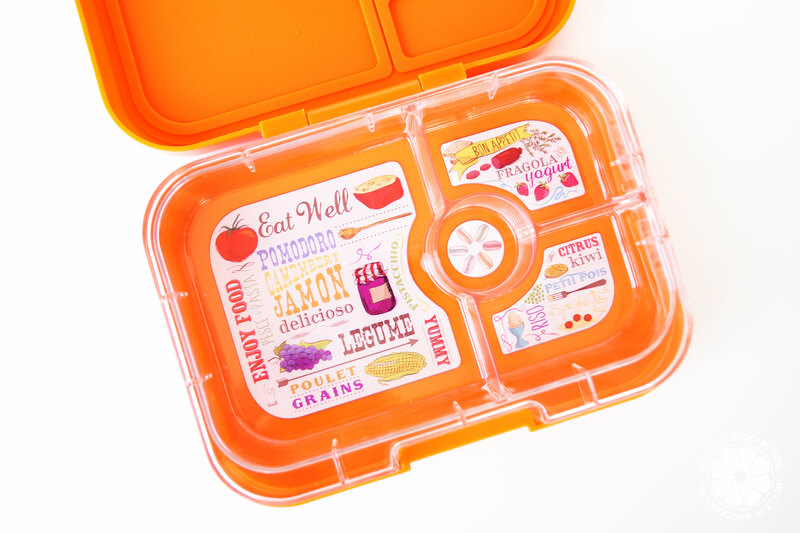 Yum Box is leak proof and they have trays with organized pre-portioned compartments, which makes it easy to create a balanced lunch. 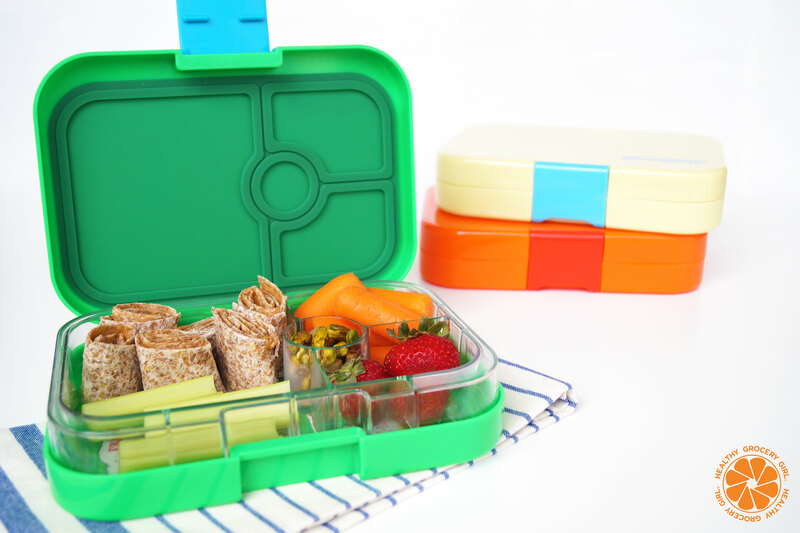 Each of their trays actually contains illustrations to guide you in packing a balanced lunch which is both cute and helpful! They are also BPA-Free, which I know we all can appreciate! You may think “kids” when you think Lunch Box, but I actually love using these for my husband and I, especially when we travel! Looking For Lunch Recipe Ideas?